If you’re looking for original and creative Halloween designs to spruce up your front porch this October, look no further. We have rounded up 15 fun and inspiring décor ideas that are bound to make your home the spookiest on the block. Spook your neighbors with this Haunted Graveyard scene on your front door step. Featuring chains, ghostly graves, a ‘keep out’ sign, and some serious slimy steps, this front yard décor is bound to give passers by the jeepers creepers. Get the instructions from Women’s Day. Not only is this flying bats door creative and effective, but it’s easy to put together and will be sure to attract swarms of Trick or Treaters. All you need is some felt or black cardboard to make authentic flying bat effects. This is also a fantastic family project that your children can get involved in. Terrify your friends with this eerie Boogie Monster silhouette. You can be sure to get some screams as he appears to lurk behind the front door, waiting for passerby’s to gobble up. Make this creepy Halloween decoration using black vinyl and some everyday household items such as tape and scissors. Fun and quirky, this spider-themed door décor is easy to make and is bound to scare any arachnophobic in town. It can be put together using a white plastic tablecloth, large shop-bought spider webs, plastic spiders and white webbing. Get the instructions from Michael’s. Create a creepy, eerie atmosphere by transforming your front porch into a giant, intricate spider’s web. Featuring oversized 8-legged crawlies and plenty of webbing, this front door décor is bound to impress the crowd on Halloween. Go all out this October and dress your door up with everything Halloween. 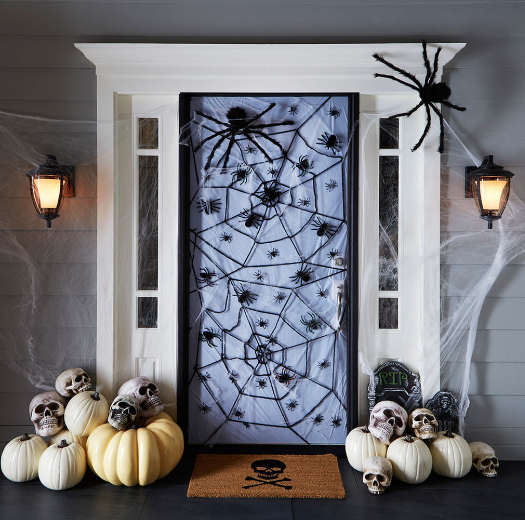 From pumpkins and crows to wild webbing and scary skeletons, this door design delivers an eclectic mix of spooky décor. Halloween is not just scary. It is also a wonderful time for family filled with pumpkin pie and autumnal décor. So why not reflect the family Halloween spirit from your front porch? This homely design features an impressive ribbon wreath, cheeky carved pumpkins, and plenty of flowers. For a more chic and sophisticated Halloween design, this decor offers something a little more upmarket this Halloween. It features a simplistic wreath, autumnal features, and big plump pumpkins. Get the instructions from Homedit. Get your kids involved in making this simple, imaginative, and hilarious Buck Toothed Gremlin for the front door. Perfect for attracting Trick Or Treaters, this green monster is easy to make and fun for the whole family. Use nothing but tape and paper to create this goofy, goggly-eyed spider for the front door. Perfect for kids and families to make together. If creepy monsters or giant spiders aren’t for you, then you can enjoy the autumnal colors of Halloween with this simplistic, stylish porch décor. Includes a hay bale, corn, pumpkins and an old ladder. 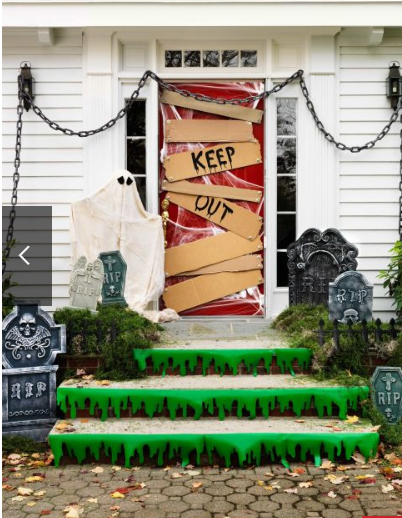 Mummify your front door with crepe paper this Halloween. With a big smiley face, your front porch is bound to draw in the trick or treaters. Perfect for young families who want to enjoy a DIY project. Give your neighbors and friends a good laugh with this tribute to the Wizard of Oz. Featuring the Wicked Witch of the West’s legs that stick out of the door itself, this fun wreath provides a wonderfully wicked optical illusion. Watch out for the three-eyed-Monster this Halloween! 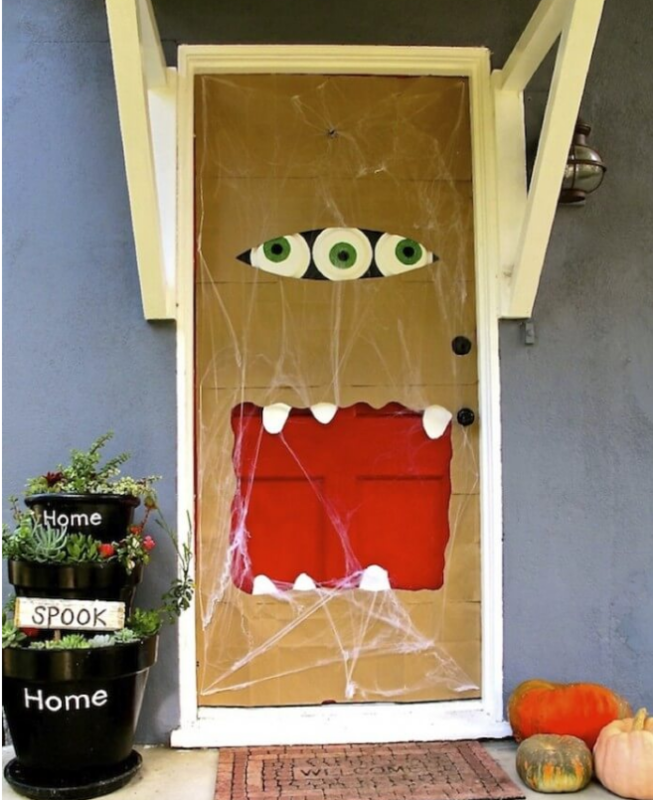 This brown, paper based door décor is hilarious fun that the whole neighborhood can enjoy. Recycle your old paper bags and put together using household DIY item. Get the instructions from Home Jelly. Scare your visitors with this simple but effective Skeleton face design. Using only black paper and tape you can cut out a perfect pattern to use as a creepy smiling Skeleton. 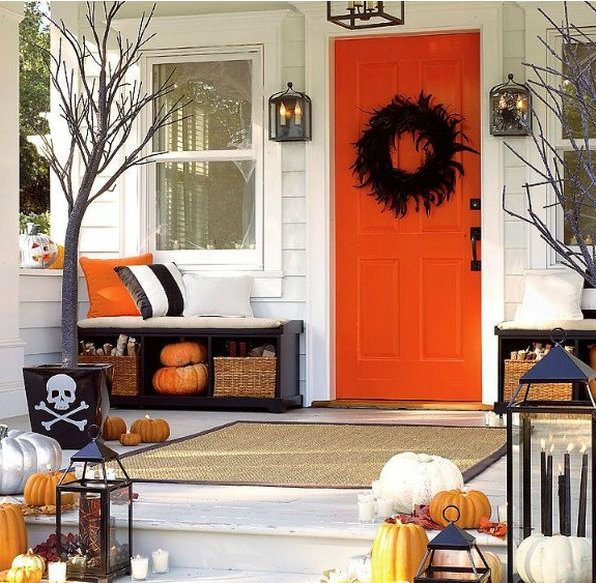 Hopefully these ideas have helped inspire you with the perfect decor for your front door this Halloween. Whether you are looking for a fun family project, the spookiest door on the block, or an elegant tribute to October, there’s an idea for you. Happy Halloween!